The Museum Internship Program at the Monterey Museum of Art provides a valuable educational experience in a professional museum environment to undergraduate students, graduate students, and recent graduates (within one year of graduation). MMA Interns meaningfully contribute to a dynamic, collaborative work environment, and are exposed to best practices in art museums. Students who wish to obtain academic credit for their internship must make their own arrangements with their college or university. Interns are presently unpaid. Requirements for specific Internships are outlined within each Internship description. The Museum Internship Program Summer Session runs from June through August. Participants are required to intern a minimum of four hours per day, eight hours per week and must complete 80 hours during the course of the summer internship. Interns are accepted twice during the year, in a Fall Session taking place from September through early December, and a Spring Session, which runs from February through May. Intern hours are flexible to accommodate class schedules; however, participants are required to intern a minimum of four hours per day, eight hours per week and must complete 90 hours during the internship session. Curatorial Intern duties may include the physical handling of artwork, observing and recording of artwork condition and location, assisting with the physical inventory of artworks in collection storage, responding to research inquiries, digital photography of collection objects, organizing collection and exhibition files, and related data entry in the museum’s EmbARK collections management database. The Intern may also assist the curatorial department with research projects and the processing of changing exhibitions and other tasks as needed. 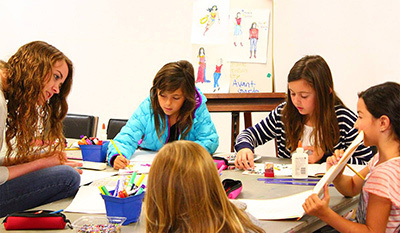 The Education and Community Partnerships Department focuses on the Museum’s engagement of children and adults through innovative programs and in-gallery experiences. Education Interns will learn about best practices in Museum Education and the dialogical model of visitor interaction. Education Interns will work with the Director of Education and Community Partnerships to engage children and adults in interactive tours and hands-on art experiences during events such as school tours, Family Days, and evening programs. Additional departments may accept internships based on availability; inquire with education@montereyart.org for details. The Museum Internship Program periodically offers opportunities in addition to the academic year and summer internships. These internships are for an extended period of time and are focused on a specific project. Inquire with education@montereyart.org for details. Prospective interns should submit an application, which includes an application form, a résumé/CV, and a cover letter expressing your interest. Selected applicants will then be interviewed and considered for placement based on the needs of the museum as well as the candidate’s interests and experience.